The Ukrainian businesses’ representative office which opened in Brussels on April 21 has joined the process of searching for business partners, investors, and markets for domestic entrepreneurs. This is extremely important as it is being carried out before the establishment of a free trade area between Ukraine and the European Union (EU), which will become effective as of January 1, 2016. The creation of the Deep and Comprehensive Free Trade Area (DCFTA) with the EU is the peak of the Ukrainian economy’s approach to Europe. The implementation of this procedure will in many aspects influence further economic development and, possibly, even the country’s future. “Ukraine should fulfill its ‘home task’ with more responsibility to streamline its economy with the conditions of the Association Agreement with the EU, and increase the influence of civil society on the quality and dynamics of structural reforms in the country. We will suggest focusing on the development of the industrial sphere as well as small- and medium-sized businesses, which are the backbone of the economy, create jobs, and generate tax revenues for the national budget. 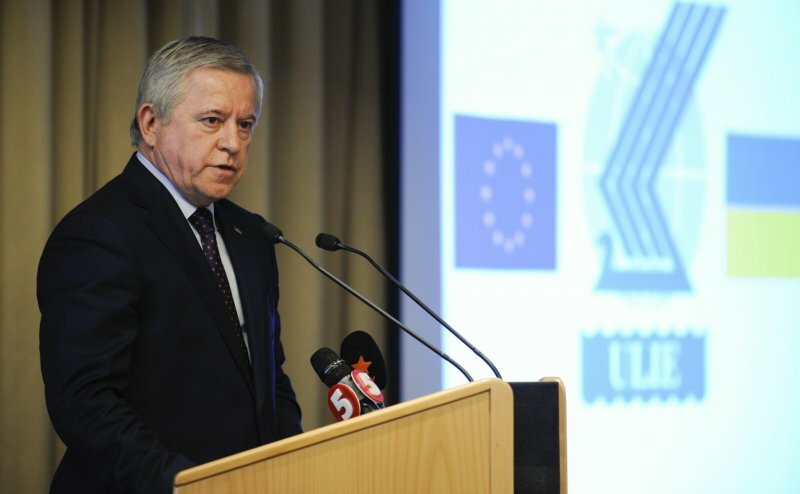 It’s of paramount importance under the conditions of economic crisis and before the changes Ukrainian enterprises will face following the full inauguration of the DCFTA between Ukraine and the EU next year,” ULIE President Anatoliy Kinakh said. Today, Ukraine has to speed up the adaptation of its legislation to free trade conditions with the EU. Some tasks have been realized in this direction – three bills (on standardization, metrology, and technical regulations) were adopted to overcome technical barriers, and two more (on food safety and animal identification) were passed to eliminate biosecurity obstacles. However, Ukraine should speed up the introduction of EU technical and sanitary standards, mutual recognition of certificates of conformity for products, and the harmonization of tax legislation with EU norms and regulations. Also, Ukraine continues to have very complicated and long standardization and certification procedures. Complicated preparations of the economy for DCFTA conditions and European integration in general require clearly organized infrastructure and good management. However, Ukraine is still without a deputy prime minister for European integration to whom a relevant government office should be subordinated. The ULIE Office is developing cooperation with all of the EU institutions – the European Parliament (EP), the European Commission (EC), the External Action Service, etc. – in order to intensify the European integration process. Its relations with BUSINESSEUROPE – the leading EU organization of entrepreneurs and employers including more than 40 national entrepreneurs’ associations of the Old World, are also very important. The ULIE Office is planning to include the Ukrainian side in talks on the possible revision of the EU Neighborhood Policy concerning Ukraine, especially its businesses. Eastern Partnership programs for business development, crediting, and training of representatives of the real sector of economy have made a noticeable contribution to the reconstruction of the economies of new EU members, namely Poland, Lithuania and Latvia. They received and continue to obtain funds for the structural modernization of enterprises and increased economic competitiveness. Similar programs for Ukraine exist, which envisage the allocation of around EUR 11 billion until 2020, three quarters of which are loans and the rest are grants. However, merely 3% (between EUR 250 million and EUR 350 million) of these funds are designed for supporting small- and medium-sized businesses, and it is still difficult to receive these funds. “European support is almost unavailable for Ukrainian businesses, first of all, because of unrealistic conditions of crediting. We will raise this issue when communicating with our European colleagues in order to change the situation, streamline cooperation mechanisms with nowadays reality, and bring specific results,” Kinakh said. The ULIE Office in Brussels will carry out a very important information function – giving Ukrainian businesses an opportunity to learn about various EU institutions’ programs, select the ones that could give our entrepreneurs modernization prospects in line with the DCFTA requirements. Many EP members, EC representatives, diplomats, businessmen and public activists, including the ULIE management, and clergy attended the Office’s ribbon-cutting ceremony. The Interfax-Ukraine News Agency is the media partner of the ULIE Office opening in Brussels. It has set up a specific information product – Ukraine Open for Business – containing Ukrainian business news for Europeans, which will help European partners better understand Ukrainian economic trends and prospects.